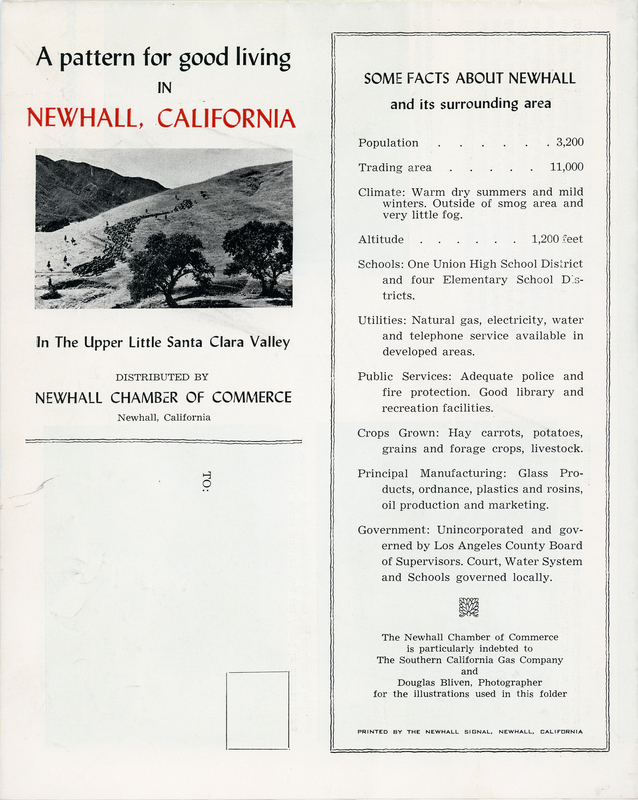 SCVHistory.com | Newhall Chamber of Commerce | Newhall: A Modern New California Town, ~1955. In the Upper Little Santa Clara Valley. The newest facilities shown are the Newhall pool (1949-1950) and the Hart High School auditorium (1952). The newest amenity mentioned is the "recently organized Little League for boys," from which we can extrapolate the date. The first pitch was thrown in 1955. The population figures are confusing. The SCV's population reportedly reached 4,000 in 1940. We'd have to guess that here, circa 1955, the 3,200 figure refers to Newhall only, and 11,000 for the "trading area" means the whole valley. 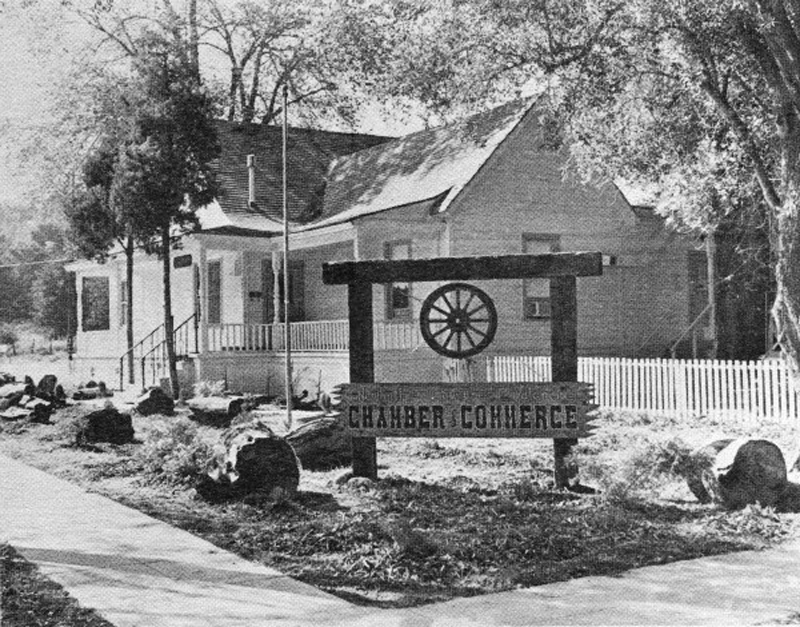 The Newhall Chamber started in 1923 and went by the name "Newhall-Saugus Chamber" as early as 1947. Why the name "Saugus" is omitted here, we don't know. There was a longstanding cross-town (or down-the-street) rivalry between Newhall and Saugus; it's possible the mid-1950s were a period of disunity. But Saugus is represented here — by Thatcher Glass and Bermite Powder Co. Also, Bill Bonelli, developer of housing in Saugus, was the chamber president in 1955. Note: The term "Henry Mayo Newhall Memorial" refers not to the hospital, which didn't yet exist, but rather to Newhall Park. Brochure from the collection of Cassandra Skaggs, granddaughter of Earl Schmidt, owner of the 6-S Ranch Airpark in today's Canyon Country and a founding Castaic Lake Water Agency board member. Climate: Warm dry summers and mild winters. Outside of smog area and very little fog. Schools: One Union High School District and four Elementary School Districts. Utilities: Natural gas, electricity, water and telephone service available in developed areas. Public Services: Adequate police and fire protection. Good library and recreation facilities. Crops Grown: Hay carrots, potatoes, grains and forage crops, livestock. Principal Manufacturing: Glass Products, ordnance, plastics and rosins, oil production and marketing. Government: Unincorporated and governed by Los Angeles County Board of Supervisors. Court, Water System and Schools governed locally. The Newhall Chamber of Commerce is particularly indebted to The Southern California Gas Company and Douglas Bliven, Photographer for the illustrations used in this folder. Printed By The Newhall Signal, Newhall, California. 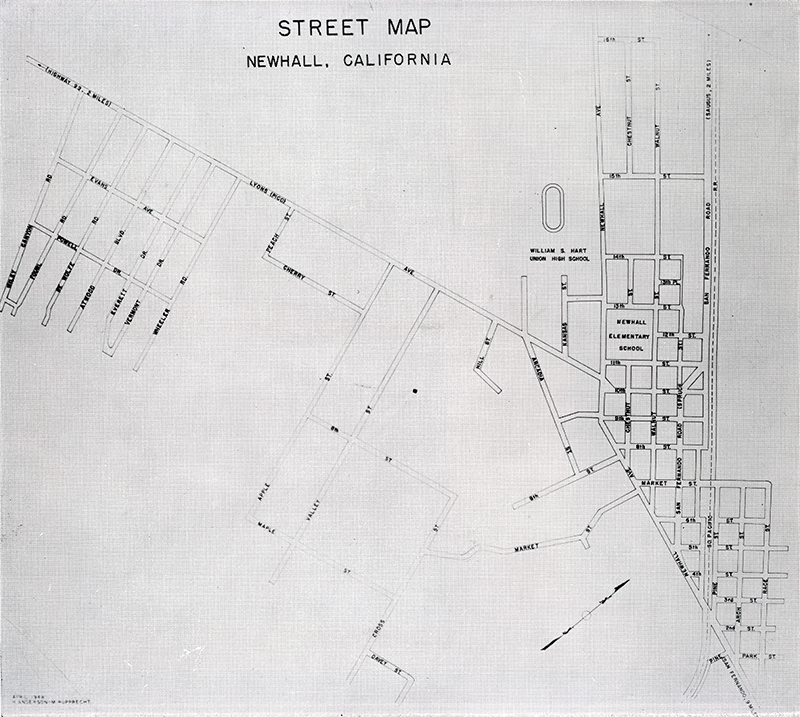 Newhall is the cradle of both the oil industry and the gold mining industry. Gold was discovered here six years prior to the discovery at Sutter's mill and in the old days several booming geld camps were in the area. Oil came later and in 1872 the first oil well was drilled with an old spring pole rig and brought in to start the first commercial oil field in California. Later the Pioneer Oil Company built the first refining plant also pictured on this page. The railroad was built through the valley in 1886 and this brought to an end the colorful freight teams and stage coaches which had run through the Valley between the small town of Los Angeles and San Joaquin Valley and Mojave desert points. The valley itself was part of an early Spanish land grant belonging to the Del Valle family. Later it was acquired by Henry M. Newhall, an early California pioneer and generally considered the father of this valley. Much of the ranch is still intact and is still owned by the descendants of Mr. Newhall. The old Pico oil field near Newhall where the oil industry was born in California. To the left is one of the modern oil rigs of today perched in the rugged mountainous area where much of the Valley's oil has been found. Whereas the old rigs pictured upper left only went down a few hundred feet, the modern rigs, have drilled over 12.000 feet in the earth. However, then as now petroleum prouction s the Valley's major industry. The two pictures on this page show a striking similarity although they are almost fifty years apart. 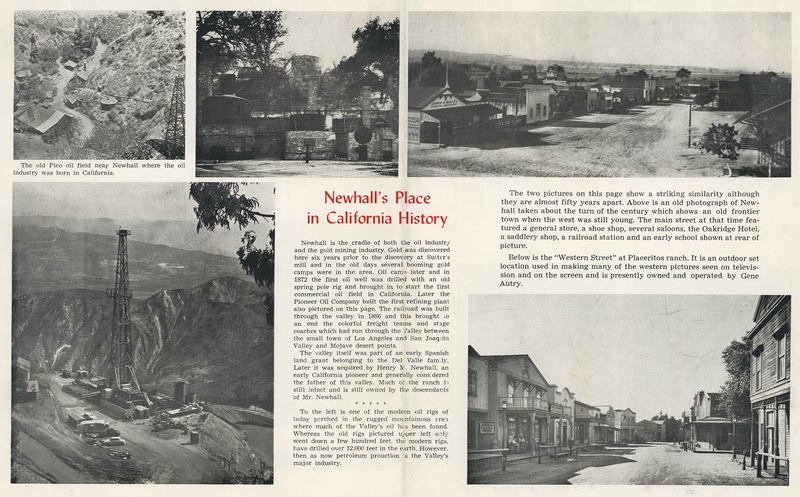 Above is an old photograph of Newhall taken about the turn of the century which shows an old frontier town when the west was still young. The main street at that time featured a general store, a shoe shop, several saloons, the Oakridge Hotel, a saddlery shop, a railroad station and an early school shown at rear of picture. Below [above] is the "Western Street" at Placeritos ranch. It is an outdoor set location used in making many of the western pictures seen on televis-sion and on the screen and is presently owned and operated by Gene Autry. Newhall is both old and new. Old in the rich traditions of California and the West, it is also new in its outlook and development. It is served by the Southern California Gas Company, the Southern California Edison Company, Southern California Telephone Company. Several freight services, the Southern Pacific Railroad and Pacific Greyhound lines provide transportation for passengers and freight. Water supplies are more than ample with a new water system having been installed recently. The water system is operated by a locally governed public water district. Rates are comparable with other Southern California areas. Police and fire protection is the finest obtainable. About 25 Los Angeles County deputy sheriffs provide 24 hour police protection. The fire department is also county operated and has several ultra-modern pumpers and a staff of professionally trained firemen. Dental and medical services are complete and the town also has a fine library. Roads and streets in the entire area are carefully maintained. Church facilities are good in Newhall with several Protestant groups and a Catholic parish also. The Newhall Elementary School is but one of the many fine schools in this area, all well staffed and completely modern. Spruce Street main business district of Newhall serves the entire upper part of the Little Santa Clara valley. It is wide, neat and has a fine representative group of business houses. Residential areas such as this are found in several parts of Newhall. Many other fine homes are now being built. The splendid auditorium of the Wm. S. Hart Union High School is a small part of this expanding multi-million dollar institution. There are many fine churches, service and fraternal organizations in Newhall. All the schools have active PTA organizations. There is a Kiwanis Club, Legion Post, Lions Club, 20-30 Club, S.P.E.B.S.Q.S.A. Chapter and many other organizations. Newhall schools are excellent. They are locally governed and are the center of many of the town's activities. The high school occupies a 20-acre campus with educational facilities which put many larger areas to shame. It features shops for industrial arts, science and photographic labs, a fine school paper and a good commercial, academic and manual arts curriculum. There are 4 elementary schools in the area all competently staffed and with an outstanding educational program for smaller children. Kids are well taken care of. In the summer there is a planned recreation program in addition to the program provided by Boy Scouts, Girl Scouts, Camp Fire Girls and the recently organized Little League for boys. Recreational facilities are present at the Henry M. Newhall Memorial and at the many Mountain campsites in the area. Shown above is part of the many operations of The Thatcher Glass Company near Newhall. The home of the late Wm. S. Hart is one of the principal landmarks in Newhall. The swimming pool at the Henry M. Newhall Memorial Park is the center of activities over the summer season. It is completely modern and is operated by the Los Angeles County Parks and Recreation Department. Part of the Newhall Ranch where much diversified farming is done, representing the many crops grown in this area. Bermite Powder Co., manufacturers of explosives and ordnance is one of the area's leading industries. SK5501: 9600 dpi jpegs from original brochure from the collection of Cassandra Skaggs.